There’s something to be said about self-explanatory titles. They help the critic and, more importantly, enable the listener to get a grip instantly on what’s happening within the record’s grooves. 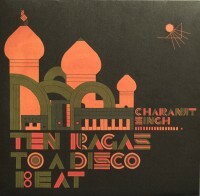 That being said, what Indian Bollywood session musician Charanjit Singh achieves on Ten Ragas To A Disco Beat is extraordinary, in that nobody had ever attempted to merge those genres. What emerges on this 1983 LP is a primitive form of acid house, a few years before the Chicago pioneers of that club-music style had conceived the Roland TB-303 squelch and TB-808 beats that propelled it into a futuristic phenomenon in the mid ’80s among heads attuned to underground electronic music. Yeah, Mr. Singh beat the Windy City producers to the punch, but it’s only since about 2010—thanks to Bombay Connection’s reissue—that anyone outside a small circle of cognoscenti in his home country had an inkling what the hell was going on in this synth sorcerer’s lab. All 10 ragas here pump and snake around the 4-on-the-floor 808 beats for about five minutes; they’re at once functional and sui generis, with the ancient melodies of classical Indian music getting synthesized into bizarre, ultra-vivid convolutions that sound so wrong they’re right. Purists will be outraged, but outraging purists is never a bad thing. “Raga Lalit,” for instance, is a gradually accelerating gyroscope of spangly, fibrillating, simulated santoor tones that causes a vertiginous rush. The rest of the album basically wrings subtle variations on this theme. If this is proto-acid house, it’s proto-acid house with a PhD in instrumental virtuosity. The mercurial motifs that swirl around the über-basic rhythms lift this project into utterly sublime, distinctive realms.